The deadline fast approached and then passed, by first days and then weeks. In the death throes I fired off one final email chasing up my funding application to carry out fieldwork at the Malaysia campus for three months. I had no expectation for a prompt response, so I was caught completely off guard half an hour later when I received a reply that began with the word Congratulations. Six weeks later, after enduring a grueling 21-hour journey with a six-hour layover, I finally touched down in Kuala Lumpur. In fact that’s one of the first things that I learned, nobody calls it Kuala Lumpur. Instead it is simply referred to as KL which conjures up a feeling of youthful vitality. On arrival I was greeted and instantly made feel welcome by the whole Active Vision team: Neil Mennie, Mazrul Mahadzir and Nadia Zulkifli. On the drive back to campus I got my first glimpse of KL; a skyline filled with tall buildings punctuated only by cranes marking future tall buildings. Prior to my arrival I hadn’t researched Malaysia, having visited a number of nearby countries I assumed that it would be ‘same same but different’. However, looking out of the car window at the rainbow of hijabs swirling in the densely populated city, I suspected that this might not be the case. The very next day I got my first glimpse of Zoo Negara and of Tsunami, the juvenile female orang-utan with whom I would be working. For the next two weeks I shadowed Maz and Nadia observing them as they carried out their experiments and taking notes that would inform my own methodology. I remember looking at Tsunami’s eye displayed on the computer screen whilst she was being eye tracked and remarking on how human it was in appearance. From an evolutionary perspective I know that we are closely related, but I don’t think that I could have differentiated it from a human’s eye. If eyes really are windows to the soul, then we have used the same double glazing company. During this time I also prepared and delivered a talk to the faculty of science. My talk centred on the human eye tracking research I had previously conducted in the UK, and how I might further this by eye tracking Tsunami using a similar task and exploiting her position as a non-human hominid. I was particularly anxious about this talk as the recent shift in time zones had rendered me not jetlagged but an insomniac reducing my mental agility to that of a slow amble across rough terrain. Prior to presenting Tsunami with the real experiment I carried out some preliminary training which allowed me to see that I would need to revise the experimental setup several times before I found a paradigm that worked. Happily in the end with the help of Sharul her keeper, we were able to maintain her attention long enough to gather some really interesting and insightful data that I hope to write up as a journal article back in the UK. As my trip draws to a close I am beginning to turn my attention back to my studies in the UK. 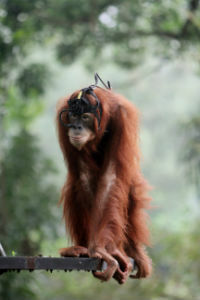 Although I am looking forward to getting home, I suspect that testing homo sapiens in a small lab without any windows will seem very tame compared to eye tracking an orang-utan in a zoo. During my stay I have met some amazing people and visited some great places across Malaysia. I also went to Singapore to attend the Asia Pacific Vision Conference and extended my stay so that I could fully explore the city-state. Although on reflection I believe it to be more a garden in a city than a city in a garden. I have many fond memories that I will take home with me, but I think the most precious are the small things that almost go unnoticed and consequently not remembered. Like the surreal moment when an infant chimp walks past holding a towel around her like she has just got out of the shower and helps herself to a snack out of the fridge. Or the fact that I have a favourite Malay song that I can sing along to at the chorus and hum on the train home although I have little understanding of the words. And finally, that moment when your surrogate supervisor announces ‘I love data’ and there’s not really much you can say to that but it kind of sums up my trip.